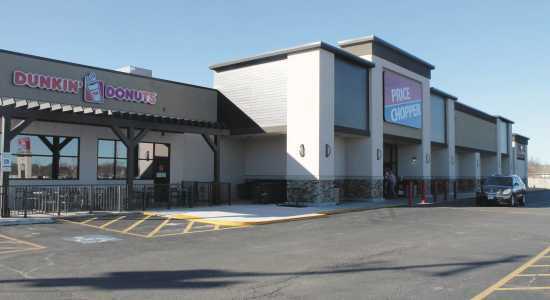 The Queen’s Price Chopper store, along with two other businesses in the Main Street Marketplace Subdivision, Dunkin’ Donuts and Fort Scott Pharmacy, plan to close soon. The redevelopment project was completed in 2017. City officials are working on a solution following a recent announcement that a local supermarket plans to close its doors. A news release issued Monday by the city of Fort Scott said city officials learned Sunday the Price Chopper store, part of a redevelopment project at 2322 S. Main St., would soon be closing. Two other businesses included in the redevelopment district, called the Main Street Marketplace Subdivision, also plan to close. “We are committed to maintaining a close relationship with Associated Wholesale Grocers, AWG, to assist in finding a suitable replacement as soon as possible,” the release states. The Price Chopper store, which opened December 2017, is part of a $9.4 million redevelopment project completed that year. The development also includes Fort Scott Pharmacy and a Dunkin’ Donuts store. Queen Enterprises LLC is the company that brought the Price Chopper store to Fort Scott.